Everything you need to build your own Pita Pocket Sandwich. Comes with: Greek Salad, Tomato & Cucumber Salad, Tabbouleh, Hummus Spread, Tzatziki (Cucumber Yogurt) Spread. Everything you need to build your own Pasta Bowl. 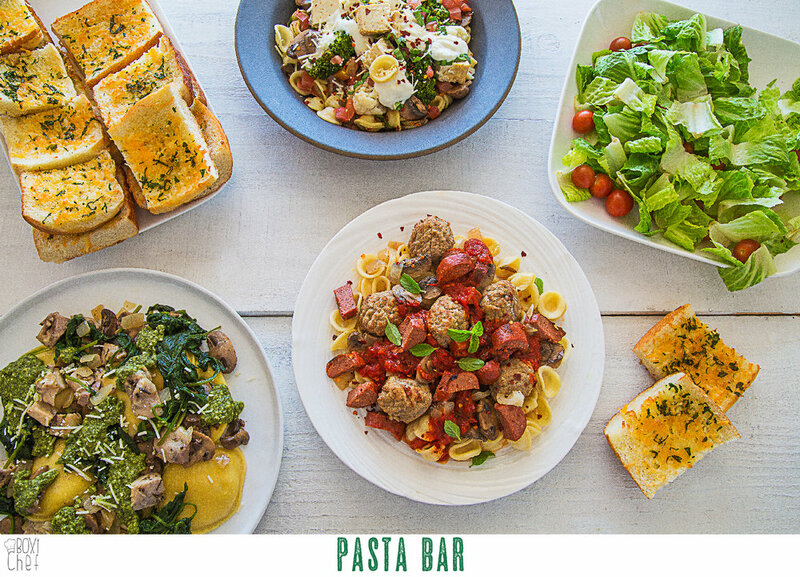 Comes with: Penne Pasta, Orechiette Pasta, Cheesy Garlic Bread, and Cesar Salad. Assorted Sauces: Tomato Marinara, Pesto, and Alfredo Sauce Assorted Vegetables: Asparagus, Tomato, Onion, Broccoli, Spinach, Mushroom. Toppings: Parmesan Cheese, Red Pepper Flakes. 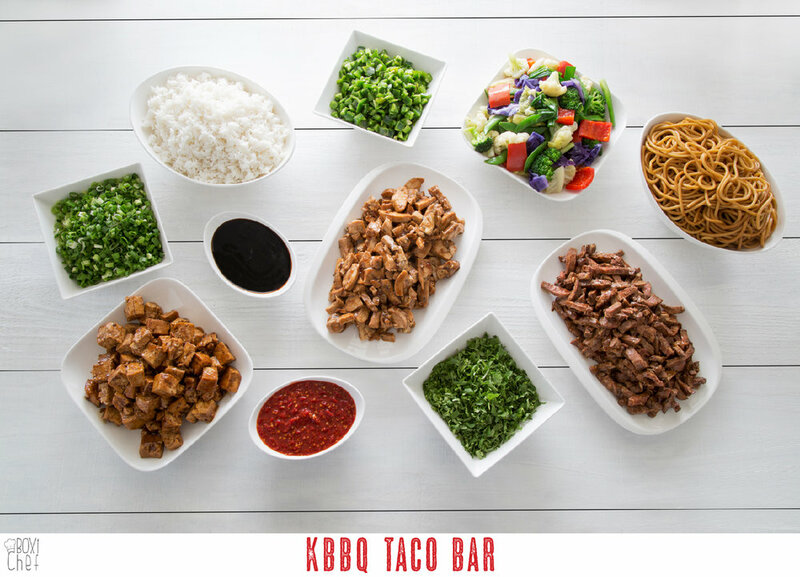 Everything you need to build your own Korean BBQ Taco Plate. Comes with: Flour and Corn Tortillas, White Rice, Green Salad, Salsa, and Tortilla chips. Assorted Sauces: Hot Sauce, Sriracha Mayo. Toppings: Kimchi, Jalapenos, Green Onions, Cilantro. 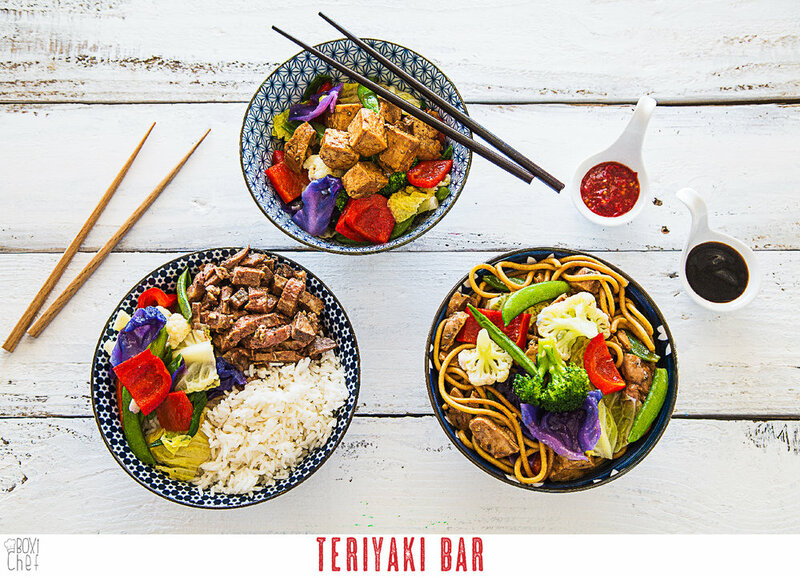 Everything you need to build your own Teriyaki Bowl. Comes with: Noodles, White Rice, Asian Mixed Veggies. Assorted Sauces: Teriyaki Sauce, Chili Hot Sauce, Sriracha Mayo. Toppings: Minced Jalapenos, Green Onions, Cilantro. Everything you need to make your own Taco Plate. Comes with: Flour and Corn Tortillas, Mexican-Style Rice, Beans, Salsa, and Tortilla chips. Toppings: Sour Cream, Three-Cheese Blend, Salsa, Hot Sauce, Onion, Cilantro, and Jalapenos. Everything you need to make your own Breakfast Plate. Comes with: English Muffins, Biscuits, Flour Tortillas, Scrambled Whole Eggs, Potato Hash, and Assorted Vegetables. Toppings: Ketchup, Mexican Blend Cheese. Everything you need to build your own Teriyaki Slider Plate. Comes with: Sweet Bread Rolls, Pineapple Coleslaw, Sriracha Mac & Cheese. Assorted Sauces: Hot Sauce, Sriracha Mayo. 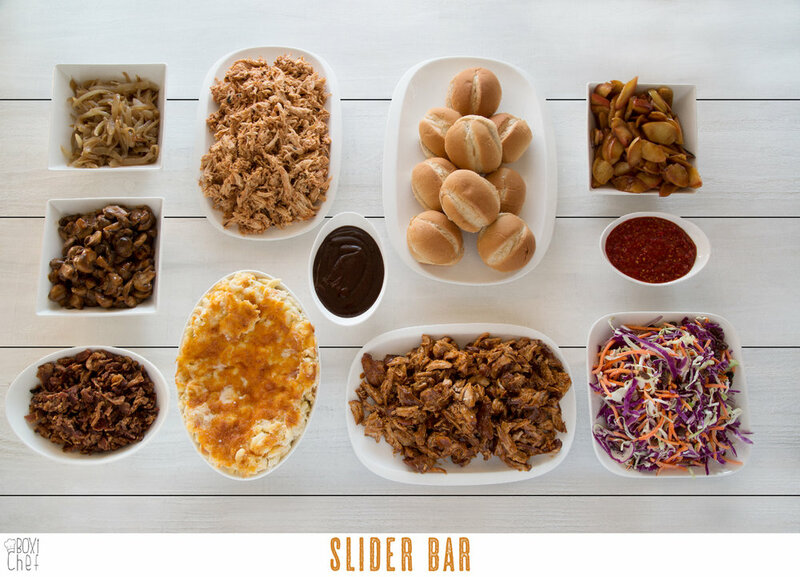 Everything you need to build your own BBQ Slider Plate. Comes with: Sweet Bread Rolls, Sweet n' Light Coleslaw, Mac & Cheese. Toppings: Caramelized Apples & Onions, Bacon Bits, Hot Sauce, and BBQ Sauce. Please include details like date, time, guest count, menu selection, and anything else important!